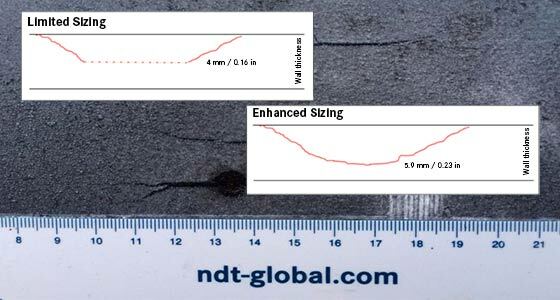 NDT Global, supplier of ultrasonic pipeline inspection and data analysis services, has announced the introduction of Enhanced Sizing to its ultrasonic (UT) crack inspection service. This new capability removes the existing depth sizing boundary for UT crack inspections, which provide uncertain sizing for depths above 4 mm (0.16 in). This innovation offers high accuracy depth sizing up to 100% wall thickness. The Enhanced Sizing provides a less conservative and more precise crack assessment for deep cracks. This breakthrough is the first major improvement in crack inspection since the introduction of absolute depth sizing more than five years ago. The innovation is a result of the continued research and development that comes from the most experienced UT crack inspection team in the industry. This enhancement is available for all UT crack inspections throughout NDT Global’s entire tool fleet. The advanced algorithms can also be applied to data from previous inspections, to deliver more precise sizing for severe cracks. Pipeline operators now have a single technology solution that provides the most accurate data across the full range of crack depths. Removing the limitations of existing crack inspections provides more accurate data, leading to safer pipelines.